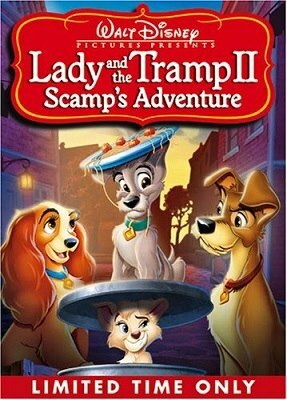 A few years have passed by and Lady and Tramp have had 4 small puppies. 3 of them are girls and look like their mother, while the 4th is a boy very similar to his father. His name is Scamp, and he is always getting in trouble around the house. One day, he misbehaves so much that he is locked outside for spending the night there. After Tramp goes to talk to him and comes back to the house mad at his son, Scamp decides to run away and join a bunch of Junkyard Dogs, finding that way that Tramp used to be one of them as well.